Could you give a great deal of credit for your success to the people who were the source of the most psychological distress in your life? I can. I thank an ex-girlfriend for recommending the one book that kick-started my long term success, and I can thank an ex-boss for motivating me to turn being fired into one of the greatest comebacks in my life. When experiencing adversity, most people take an external focus and blame others for their circumstances. Successful people know to do just the opposite – they turn their focus inward and find the specific tools and support necessary to overcome their circumstances and grow stronger and wiser for their experience. The path I’ve taken to my current level of success is very clear – every time I read a great book and take action, I get stronger and success comes much easier. And there are 5 books in particular that have fundamentally changed my life for the better. 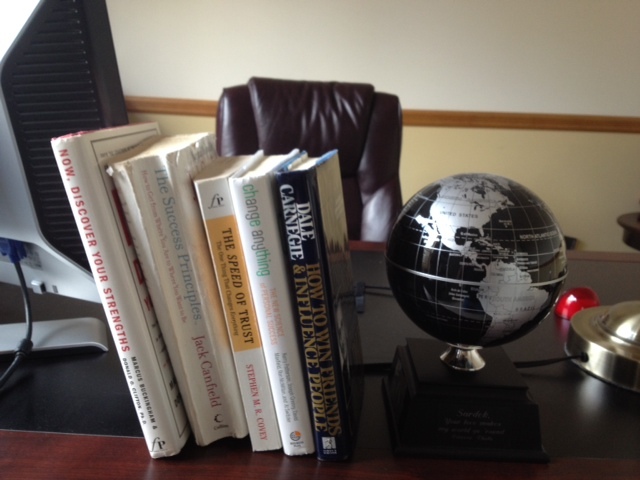 Here are the 5 books I call my professional bibles – books that will explode your success if you’re willing to be humbled, admit your contributions to your current circumstances, and take action to make course corrections in your life. It all started with this book. I was a new manager, and I was dating Stephanie, who was an avid reader. As an experienced manager, she recommended I read this book to develop my influencing skills. Before she broke my heart a few years later, we spent time sharing and learning together. In fact, she coached me through the concepts in this book during a bus trip we took. Specifically, I learned the 6 ways of making people like me and the 12 ways of winning people to your way of thinking – techniques that serve as the foundation of my success as an internationally recognized leadership expert. This book has sold over 15 million copies – you should add to that total and get a copy because it will change your life for the better. Now, Discover Your Strengths by Marcus Buckingham and Donald Clifton, Ph.D.
Seeking to recover from the pain associated with my break up with Stephanie, I sought to gain a deeper understanding of myself. This book was the perfect fit! I, like most people, did not know what my natural strengths were; I assumed they were my subject knowledge. What I realized after reading the book and taking the Strengthsfinder assessment is that I had a knack for fixing things. It made sense based on my career choices, and it opened a whole new world of understanding. It also allowed me to grow the performance of my team at MetLife. We became office of the year out of 27 regional offices due, in large part, to every person on my team knowing and working in their areas of strengths. Get the book, take the assessment, and orient your work and personal life to take advantage of what you’re naturally good at doing. Riding the wave of success at MetLife, I was already thinking about my future, and I decided I wanted to pursue my dream of becoming a management consultant. So I took a role in the consulting industry. This book was referred to me, and once I began reading it, I was amazed at how timely it entered into my life. God knew I would need the principles soon, so he was preparing me. I had no idea just how prophetic the first chapter – Take 100% Responsibility for Your Life – would be. As a result of reading the book, I learned how to write a powerful personal vision and mission statement – which I still live by years later. I also learned several critical skills such as the power of positive thinking, the power of taking action, and how to build my SUCCESS team. Fortunately, I developed these skills just in time because I would need them in December of 2006. After becoming a program manager at the prestigious consulting firm Booz Allen Hamilton, I was excited and I made great friends there. Unfortunately, I was unprepared for the style of management my boss utilized. The truth of the matter is, we never clicked. He wasn’t a bad person. I wasn’t a bad employee. Looking back, I realize I spent most of the 2nd half of 2006 in a trust rut – I couldn’t trust my boss, and as such, my decision-making suffered at work and at home. My boss fired me on December 8, 2006 – a true blessing in disguise – allowing me to get centered back on my values identified from “The Success Principles”. But I needed more because I now suffered from an inability to trust. The first action I took was to begin working on my trust phobia, and that’s where “The Speed of Trust” came to the rescue. Of all of the books I’ve read, this one had the most fundamental impact on me; it literally changed my life. Once I committed to becoming a man of character based on trust, I eliminated the very bad habits that had derailed my success at the consulting firm. I also credit this book for providing me with the skills to become the man worthy of the love bestowed upon me by Thida, the absolute love of my life. The one thing I learned from this book – you will not be successful in any aspect of your life if you cannot be trusted. I’ve written about this book extensively in other blog articles. Change is difficult, yet it is much easier when you know how to attack the status quo and the many different things that reinforce the status quo. As John Maxwell once said, “1 is too small a number for success.” Get this book, and you’ll learn just how true that statement is, and you’ll learn some terrific strategies for changing anything. These are my 5 professional bibles. Since 1997, these have been the most powerful, most influential, most life-changing books I’ve read. They are the foundation of my success, and I highly recommend them to you if you want to explode your own success. For more tips and strategies on thinking your way to success, visit the rest of this website, subscribe to this blog, and follow me on social media (Twitter, LinkedIn, YouTube, and Facebook). By doing so, you will gain access to leading edge research on management and leadership development and have access to daily inspirational and motivational quotes that will drive your success trajectory upward. So don’t delay, follow me and think yourself to success today!